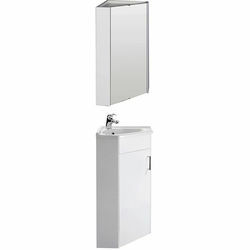 Ultra Marvel > Corner Vanity Unit With Ceramic Basin & Mirror Cabinet (White). Marvel corner vanity unit in white with ceramic basin and mirror cabinet. Soft close door with chrome handles. Ceramic basin (1 tap hole). Mirror bathroom cabinet with internal shelf. 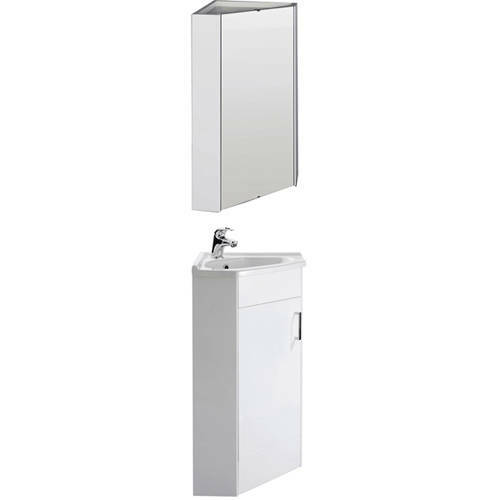 Vanity unit size: W555 x H800 x D395 mm. Mirror cabinet size: W459 x H650 x D294 mm. 5 Year guarantee: Ultra guarantee there Marvel bathroom furniture for 5 years. The Ultra Marvel furniture range offers elegant curves in all the right places and a stunning high gloss white finish gives Marvel a beautiful, timeless appeal. The Marvel design has it all - a sleek uncluttered look and easy installation that cleverly hides unsightly pipework.